A Point Of View: What is history's role in society? History is just as important as science and engineering when it comes to fostering innovation and helping people to think analytically, says Sarah Dunant. A few weeks ago, an exhibition opened in London's Royal Academy galleries. Called simply Bronze, it celebrates a metal so important it has its own age of history attached to it, and so responsive to the artist's skill that it breathes life into gods, humans, mythological creatures and animals with equal success. 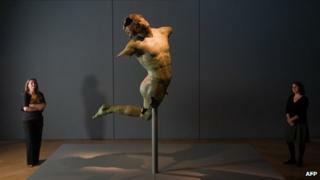 The first thing you see as you walk in is a male figure dancing in the air, athletic and graceful in equal measure, despite the fact that he is missing both arms and one leg. Two and a half thousand years ago, this dancing satyr would have been part of a group. His lost companions are probably still somewhere in the ocean bed around Sicily from where he was dredged up by fishermen in 1998. The exhibition is rich in similar moments of revelation - a 1st Century mask and helmet found by metal detection in a field in Britain two years ago and a 4th Century BC head of a king unearthed in a tomb in Bulgaria in 2004, the face so lifelike and belligerent that it makes you want to run for cover. It also has historians of the early Hellenistic period re-evaluating the level of artistry in Thracian culture. It is remarkable to think that had Bronze been mounted say 15 years ago, the portrait of the past that it delivered would have been subtly different. History is very far from a done deal. Of course, at one level we know that. Historians are always rewriting the past. The focus on what is or is not important in history, is partly determined by the time they themselves live in and therefore the questions that they ask. The history I grew up with was largely still the long march of power - kings, queens, wars, governments, the development of parliamentary democracy with some colourful characters thrown in and the whole edifice backed up by shelf-loads of racy historical novels which coated dry dates with the honey of romance. In 1534, England leaves the Catholic Church - otherwise known as the "will she/won't she? courtship" of Anne Boleyn. I, like many readers - not to mention the heroines themselves - succumbed to this (what shall we call it?) droit du seigneur version of history. By the time I hit university things were already changing. Marxism had arrived into academic history, bringing a heightened attention to the long arc of class and economics, for which among others we have to thank the mighty Eric Hobsbawm who died at 95 this very week. Then came another forceful -ism connected with women (excuse me, what exactly were half the population, or rather those not born royal or married to Henry VIII doing in history?) followed by equally powerful questions about race and racism. The idea of history as a procession of dead white males written by live ones may sound ridiculous now, but the war inside academia to open up a wider perspective was a real and often nasty one. But oh, what wonders it unearthed. The practise of micro-history for example - the way you could construct pictures of forgotten communities or individual lives from state, parish or court records proved breath-taking. Carlo Ginzburg and Natalie Zemon Davis are the acknowledged giants of this particular historical revolution. Ginzburg's most famous book The Cheese and the Worms was based on an inquisition case in 16th Century Italy against a miller with a particularly novel version of Genesis. He believed the world was formed out of chaos, as he saw cheese formed out of milk - with the angels, God one of them, - appearing like worms inside the mixture. The story of how this largely uneducated but opinionated peasant stood up for himself through a number of trials (he eventually ends up at the stake) is riveting. Zemon Davis' iconic work The Return of Martin Guerre is better known, partly because it was taken up by film. It, too, drew on a court case, this time in 16th Century France. Eight years after a certain Martin Guerre disappears from his village and his marriage, a man claiming to be him walks back into both. But is he really Martin Guerre? With no images or mirrors in such places (how does that affect memory, and the construction of identity?) no-one can be sure. Except, surely, his wife? Nathalie Baye's face in the movie when she refuses to denounce him in court (the him in this case being Gerard Depardieu) is a heart-stopping moment, but also one that hints at a world hardest for historians to penetrate - women's emotional life and what takes place behind the bedroom door. All this exposes the current assault on the humanities within higher education as even more philistine. As far as one can tell the thinking goes like this: the study of history, English, philosophy or art doesn't really help anyone get a job and does not contribute to the economy to the same degree that science or engineering or business studies obviously do. Well, let's run a truck though that fast shall we? The humanities, alongside filling one in on human history, teach people how to think analytically while at the same time noting and appreciating innovation and creativity. Not a bad set of skills for most jobs wouldn't you say? As for the economy - what about the billion pound industries of publishing, art, television, theatre, film - all of which draw on our love of as well as our apparently insatiable appetite for stories, be they history or fiction? One could wish that the history bit was sometimes more accurate. No-one would dare to mess with science in the way they mess with history. Imagine an account of Newton where the apple goes up a few feet before it started to fall. But at least it keeps a sense of the past alive and dynamic. And at its best the results can be stunning. Take historical fiction. Though there is no end in sight to bad novels about the Tudors - in America you can hardly see the surface of the water for the feeding frenzy of agents, publishers and writers producing more ruffs and bodices - there are also brilliant ones and I am not just talking Hilary Mantel. To balance one's view of America, consider the issues of race and slavery. Toni Morrison's Beloved grew partly from this new historical focus - an imaginative tour de force that animated an inner life of slavery, it pushed the modern reader past knee-jerk guilt to confront what felt at times like superior humanity. Or Valerie Martin's award-winning novel Property which entered the same difficult history from a white woman's perspective. Such fictional techniques - writing from inside created characters - are of course not open to historians, but larger topics such as emotions or physical pain - their role and changing meanings within history - are very much up for grabs with big studies on both taking place at Birkbeck and Queen Mary universities in London. From the novelist's point of view the symbiosis between the two disciplines has never been so close or creative. I speak from personal experience here. Working as I do within the Italian Renaissance, I could simply not have attempted the novels I have written 20 or even 15 years ago, since much of the material - the lives of nuns or courtesans for instance - did not exist in the public domain. Like the unearthing of that Thracian head this is history as a kind of archaeology - scholars mining their way through literally tons of state, church, convent, records in order find the seams and nuggets of gold contained within. These include as the visionary - and unpopular - abbess in the Italian city of Pescia who was spotted shoving needles into her palms to fake her own stigmata. The Roman courtesan who writes metaphysical treatises, or the Venetian one who defends herself in court against charges of witchcraft. Or the musically talented nun in the same city who sneaks out of her convent during carnival to meet a certain priest outside the walls. When she is caught, her defence (and all the evidence suggests it to be true) is that the pleasure they shared was not carnal. They were going to the opera together. One could not - dare not - make it up. History. Any society that doesn't pay proper attention to it not only has dangerously shallow roots, but also risks starving its own imagination.